1. The 30s are the new 20s – In the real sense that adolescence now seems to run on ad nauseum, no matter what one’s ostensible responsibilities are: parenthood, career, et al. I feel, with certain exceptions, that my generation has taken “Peter Pan” syndrome to the next level – creating feelings of entitlement and invincibility. When drugs enter into that picture, as they did for Heath Ledger, Brittany Murphy, and Corey Haim – all people old enough to know better than to mix medications – the results are carelessly deadly. Instead of a 23 year-old River Phoenix collapsing in front of the Viper Room after a coke binge, in the 21st century, we see delayed Hollywood hedonists going to sleep in their own beds and never waking up. 2. Simultaneously, and somewhat paradoxically, the 30s and are also the new 40s. – Though Peter Pan may never want to grow up, there does come a time when self-awareness creeps in, no matter how long one has fought against it. If one if 38 years old, living with his mother, as Haim was, and a Hollywood hasbeen with a pill problem, he must occasionally experience twin realizations: what has been lost as well as what will never be again. I would argue that nothing is more soul deadening than the combination of youth and failure, a sense that you have years in front of you, only to remember what you’ve already missed. No wonder so many of these sad individuals turn to the easy coping strategy of self-medication. For them, the cliche midlife crisis comes a decade early. Lindsay Lohan would seem to be a candidate for succumbing to the combination of an ever unencumbered adulthood, and the knowledge that she has already seen her professional peak. At only 23, she is ramping up the new Hollywood breakdown cycle. However, I think my hypotheses are applicable to 30-somethings outside of Hollywood as well. On a much smaller scale, I am not immune to waffling between the idea that I am not fully formed, yet should have accomplished something bigger by now. But what I have, that I fear Heath, Brittany and Corey did not, is a proper support network, people who genuinely care about me. For my sister, husband, family and friends, there would be no fear or enabling if I went off track. They would try to pull me back, because their own fortunes are not tied to my professional solvency (I am talking to you Simon Monjack!). Money and selflessness are two words rarely viewed in the same sentence. 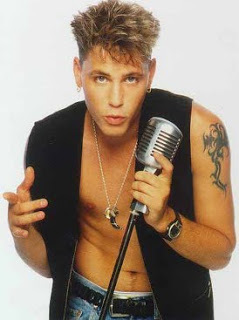 I started this post with the intention of waxing nostalgic about Corey Haim’s memorable performances – Lucas, The Lost Boys, License to Drive and other staples of the 1980s. However, there are plenty of web and TV tributes of that sort already. I like to think this spate of young celebrity overdoses presents a learning opportunity. A platform for discussing how we, as a society, can help reverse the trend of avoidable prescription drug deaths amongst young people, both famous and not. Deaths that I postulate are brought about in part by a combination of being told as a child that you will own the world (I think generations before were taught to think a bit smaller), then realizing well into your adulthood that you might just be a regular person. Why is that so tough to accept in the media age? There is no pill you can pop which cures normalcy.